Acknowledged author wrote CONSTITUTIONAL LAW 5 comprising 1900 pages back in 2016. Textbook and etextbook are published under ISBN 1454876476 and 9781454876472. Since then CONSTITUTIONAL LAW 5 textbook received total rating of 4 stars and was available to sell back to BooksRun online for the top buyback price of $72.11 or rent at the marketplace. Buy a new version of this Connected Casebook and receive ACCESS to the online e-book, practice questions from your favorite study aids, and an outline tool on CasebookConnect, the all in one learning solution for law school students. CasebookConnect offers you what you need most to be successful in your law school classes – portability, meaningful feedback, and greater efficiency. 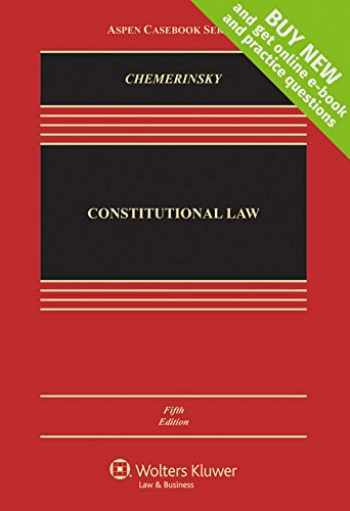 A leading fifth edition text by a prominent scholar, Constitutional Law, is known for its concise, yet comprehensive presentation. Professor Chemerinsky’s distinctive approach presents the law solely through case excerpts and his own essays, and with the author’s context and background information, the law becomes more readily understood. The text’s flexible organization accommodates a variety of course structures so that no chapter assumes that students have read preceding material. Finally, a complete Teacher's Manual and Annual Case Supplement round out this acclaimed Constitutional Law text. Features: Comprehensive coverage; accessible writing style Distinctive approach presents the law solely through case excerpts and author-written essays Provides context and background information Flexible organization—no chapter assumes that students have read other chapters Updated throughout; includes major new cases CasebookConnect features: ONLINE E-BOOK Law school comes with a lot of reading, so access your enhanced e-book anytime, anywhere to keep up with your coursework. Highlight, take notes in the margins, and search the full text to quickly find coverage of legal topics. PRACTICE QUESTIONS Quiz yourself before class and prep for your exam in the Study Center. Practice questions from Examples & Explanations, Emanuel Law Outlines, Emanuel Law in a Flash flashcards, and other best-selling study aid series help you study for exams while tracking your strengths and weaknesses to help optimize your study time. OUTLINE TOOL Most professors will tell you that starting your outline early is key to being successful in your law school classes. The Outline Tool automatically populates your notes and highlights from the e-book into an editable format to accelerate your outline creation and increase study time later in the semester.